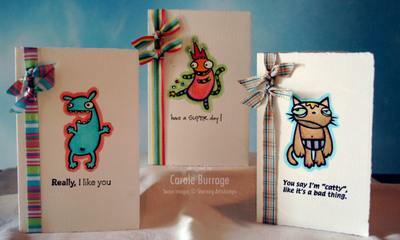 I thought this cute little Pip & Oggy image by DoodleFactory for Starving Artistamps would be just right to illustrate the notion of a little guy wanting to be like his Daddy. This'll be Carter's card to give his Dad this Father's Day. Q: What type of glue did you use with the Clear Scraps album? A: Alma sent all of us a bottle of Zip Dry Paper Glue, which the Clear Scraps folks recommended to her. That stuff is wonderful! It goes on precisely and dries in a flash. In fact, I think I'm going to take it instead of lugging my ATG Gun to the swap this weekend. Q: What season are you? A: I'm most likely a Summer, but I tend to dress like a Winter. I look like something Sprinkle would cough up in anything with warm, orange-y undertones. Well, that may actually be a little bit stronger than how I feel, but for lack of a more precise term, let me say that I am dreading the day ahead of me. I have a ton of stuff to do in order to host Bunco at my house tonight, including some serious cleaning and cooking dinner and dessert for 12 women. I know it will be a lot of fun -- it always is -- but I dread and drag my heels around all day long, get distracted by this and that, and then have to furiously play catch up in the couple of hours before my friends arrive. Why? Why do I do this? I don't know. It just always seems to work out this way. Supplies used -- Stamps: Father Figure by Verve Visual, image by DoodleFactory/Starving Artistamps, oval by A Muse; Paper: Basic Black, Purely Pomegranate, Soft Sky, Georgia Pacific white, dsp by Stampin' Up! ; Ink: Purely Pomegranate, Brilliance Archival Graphite Black, Going Gray, VersaFine Archival Onyx, Soft Sky re-inker; Accessories: Nestabilities, Copic Sketch Markers, AquaPen with Alcohol, Bella Bauble, ribbon from Taylored Expressions. ... as if you didn't know that already! Do you ever make the same card over and over again, but with different stamps? 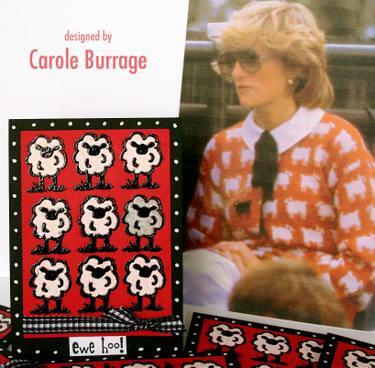 The Diana Sweater is definitely a leitmotif in my stamping. If I have a stamp of a little lamb -- and I love me a lamb stamp, so if I see a cute one, chances are I will eventually have to have it (dang that Anna Wight and her adorable new Bo Peep set!) -- it will eventually end up stamped multiple times, and on a field of red there will be one black or gray among the white. 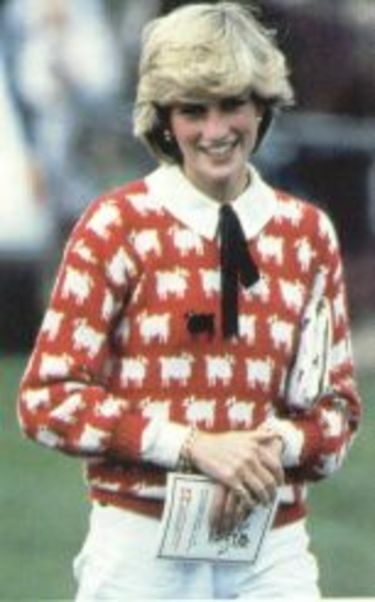 When the late Princess wore this sweater to a polo match in 1983, she caused a fashion sensation. I was 12 at the time. I remember thinking that was the coolest sweater ever, and wanting a knock-off so badly. I loved Princess Diana; she was so beautiful and glamorous, and her favorite band was Duran Duran (see?! We had so much in common! Well, except I had glasses and braces and was in the middle of what had to be one of the most painfully awkward adolescences known to girlkind). Never got one, but now I make one for myself every so often out of cardstock and ink. Isn't this little bee adorable? 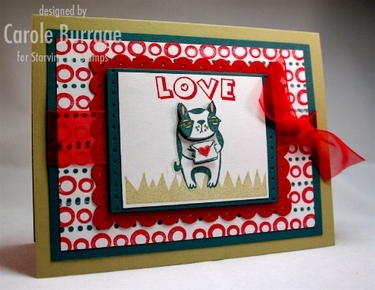 And even though he's part of the DoodleFactory Valentines set, he's versatile enough to use all year long. I'm thinking that little heart he's carrying is a declaration of love for the Queen Bee; he wouldn't just do that on Valentine's Day -- he'd do it every day, much like my DH does (yes, in fact, Sean does bring me a sparkly little heart daily. Really. No kidding. It's true, for all you know...). I made this using Jen's Saturday Sketch for You To Try; be sure to check out what Shannan, Susan, and Jen's Guest Designer, the fabulously talented Bethany Paull have done with this loverly design. The bee was heat embossed with black embossing powder on cheap-y Georgia Pacific White cardstock, then colored in with Copic Sketch markers. His heart was filled in with red stickles. The honeycomb background was created by running Fiskars Texture Plates through the Cuttlebug, then taking a brayer and running black ink over the embossed image. Whenever I use the Fiskars Texture Plates with the Cuttlebug, I get a lot of questions about how to do this. It's really easy -- here's your sandwich: plate A, Fiskars Texture Plate (desired pattern facing up), cardstock (I spritz mine with a little water first to get greater relief in the embossing process since the Texture Plates don't make nearly as deep an impression as Cuttlebug embossing folders), then rubber plumber's gasket (I got mine at Lowes; it came in an 8" x 8" sheet), and finally plate C. Run the sandwich through the Cuttlebug and you're done! Supplies Used -- Stamps: DoodleFactory Valentine set and Mini Positive Words by Starving Artistamps; Paper: Real Red, Basic Black, YoYo Yellow, Georgia Pacific White; Ink: VersaMark, Basic Black, Real Red; Accessories: Cuttlebug, Fiskars Embossing Plates -- honeycomb pattern, brayer, silk flower by Doodlebug Designs, red flower by Prima, Blackbird Brad by MOD, ribbon, red Stickles, black embossing powder, dimensionals. By the way, I am apparently the object of identity theft. 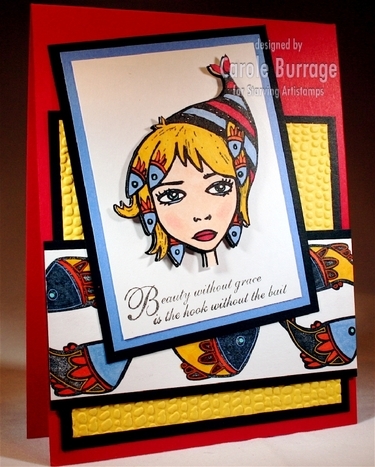 It seems someone has posted a despicable card on Gina K's blog under my name as Gina's Guest Designer for February. As if I would adulterate the innocent Dr. Feelgood created by my good friend Carolyn with the abominable likeness of some heathen heavy metal freak! Me?! The same person who made that sweet little bumble bee card above?! Why, it's preposterous!! I'm offering a substantial reward to anyone who can help me track down the REAL stamper of that, that... paper travesty. This rubber-stamping menace-to-society and ruiner-of-my-good-name must be STOPPED!!! I'm really excited to now be a part of the Blogger's Challenge group! 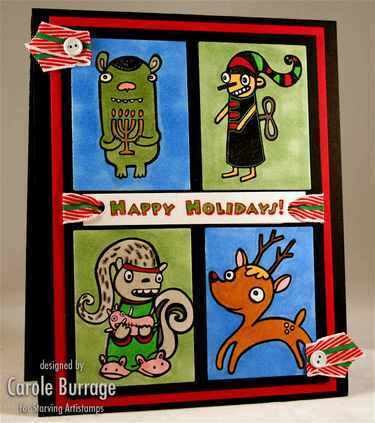 I've played the challenge as a guest in the past, and when Lisa Somerville (who coordinates the Blogger's Challenge) joined the Starving Artistamps Design Team recently, I reminded her that I still wanted to join the group if there was ever a opening. Well, lo and behold, I must have been in the right place at the right time, because I received an invitation to join! Each Friday, members of the Blogger's Challenge group post their interpretation of that week's challenge. This week's challenge was a color challenge, to use River Rock, Blue Bayou, and Real Red. ETA: If you're interested in purchasing the DoodleFactory Valentine images, they will be posted on the Starving Artistamps website by 7:00 p.m. EST tonight, January 18, 2007. I'm going to be adding a list to my sidebar of all of the other participants of the Blogger's Challenge so you can click to see what they make; you're sure to recognize most of the names, and I know at least a couple of your favorite stampers are members, including one of the very first stampers I ever considered a 'Stamping Idol' (make sure the theme from 'American Idol' plays in your head right now): Leigh O'Brien. To borrow a phrase from the Police, "Every little thing she does is magic," so make sure to check her stuff out. I guarantee you'll be inspired! Supplies used -- Stamps: DoodleFactory Valentines and DoodleDads, distributed by Starving Artistamps; Paper: River Rock, Blue Bayou, Real Red, Georgia Pacific White; Ink: Real Red, Blue Bayou, River Rock; Accessories: Nestabilities, paper piercer, small hole punch, ribbon, Dimensionals. Paper Pretties is having an "Out With the Old -- In With the New" Sale in the Paper Pretties Boutique (Christie needs to make room for all of the new stuff she's going to be ordering at CHA for our paper crafting pleasure)! So go to there and click on the "Sale" tag -- new items will be added daily! Sketch for You To Try! I was able to kill three -- count 'em, three! -- birds (or should I say fish?) with this card! I love it when that happens! 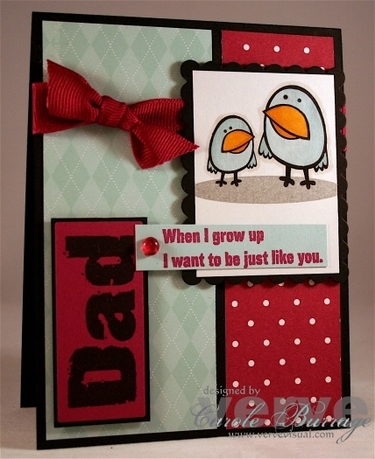 Bird #1: this card was made with Jen del Muro's Saturday Sketch for You to Try. I'm usually such a linear type of gal that I rarely think to tilt my panels, but with these funky images, I think it works really well. Bird #2: today's Inspiration Challenge on SCS -- to make a card based on this fishy necklace -- helped me get my creative juices going. Bird #3: it uses the awesome new Grace Girls images by my beloved DoodleFactory (available at Starving Artistamps), which I've been dying to get inky. She need to wash those fish right out of her hair, don't you think? Be sure to visit Susan Liles to see what she's come up with for this sketch. (Shannan's can be seen in Jen's sketch post) And, if you're inspired to make something with it, put SFYTT as a key word when you post to your gallery so we can be sure to check it out. Lastly, if you haven't entered for my Thanksgiving Blog Candy yet, keep reading and do so! The drawing will be next Thursday. Supplies used -- Stamps: Grace Girls and fish by DoodleFactory, available at Starving Artistamps; Paper: Real Red, Ballet Blue, Yo-Yo Yellow, Basic Black, Georgia Pacific White; Ink: Staz-On Black; Accessories: Cuttlebug, Copic Sketch Markers, 3-D Dots. Saturday Sketch and Belated Freakshow! 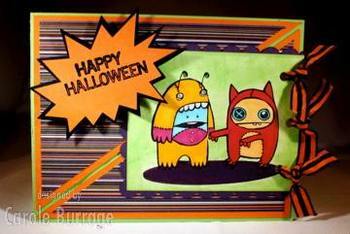 The card you're viewing is made with Jen's weekly Sketch for You To Try. For a diagram of said sketch, check www.iheart2stamp.com. I love the funky starburst, and when I saw it, I knew I wanted to join it with these equally fun and funky DoodleFactory stamps, available from Starving Artistamps. To make the starburst, I printed off Jen's sketch and cut it out from there. I taped it onto some Basic Black and trimmed around it with my Paper Snips, then took the template and stuck it onto a scrap of Pumpkin Pie, and trimmed that slightly smaller. Piece o' Candy! And check out my pals, Shannan and Susan's blogs for a different spin on the same sketch. Warning -- they'll make you want to blow off your nobler plans (laundry, in my case) and get inky! Supplies used: Stamps: DoodleFactory Halloween by Sun Spirit Studios, distributed by Starving Artistamps; Paper: Green Galore, Pumpkin Pie, Basic Black, Elegant Eggplant, Nina Crest Solar White, patterned paper by Cricut; Ink: Brilliance Archival Graphite Black, Elegant Eggplant, Green Galore; Accessories: Black embossing powder, Copic Sketch markers, 3-D Dots, Ribbon, Crop-A-Dile, Spellbinders Nestabilities. 1. McDonald's McRibs -- my DH thinks they're disgusting. Me? I say CHOMP!! 3. Corduroy -- pants, jackets, shirts (though not all at one time...) -- you name it. It's always in fashion with me. There is something deeply cozy and comforting about cords! 4. Meredith Baxter Birney as Betty Broderick in "A Woman Scorned" and "Betty Broderick: Her Final Fury" -- these are frequently on Lifetime and shown as a double feature. If MBB as crazy Betty is on the tube, I am compelled to watch. 5. Mustard on fried potatoes. 6. Madras plaid (particularly in patchwork), Lacoste shirts, Tretorn tennis shoes, and Bermuda Bags. I thought the Official Preppy Handbook was gospel -- by the time I realized it was a satire, it was much too late; the OPH was already deeply ingrained in my psyche. 8. The cheap scents of Lady Stetson and Forever Krystal (named for the protagonist in Dynasty, for Pete's sake!). I may not have worn these since college, but I still think they smell divine. I am exceedingly fortunate to have a very cool mother-in-law who I not only love, but really, really like, too. My oldest boys (DH and ODS -- ornery/oldest DS) went down to Dallas this past weekend and hooked up with the rest of the Burrage clan for OU/TX weekend. My MIL sent home with them an adorable OU denim jacket and baseball-style shirt for YDS (yappy/youngest DS), so I need to send her a thank you note. Plus, with it being October and all, I want to make use of my Halloween stamps as much as possible before I have to tuck them away for another year. 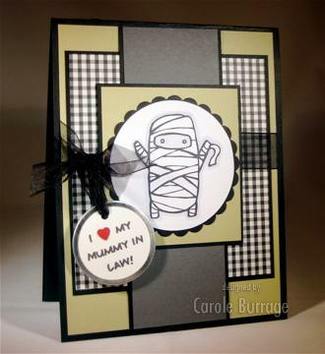 This cute little mummy is from the DoodleFactory Halloween stamps available at www.starvingartiststamps.com. I used today's Color Challenge scheme of Basic Black, Basic Gray, and River Rock, and the fab layout is from my pal Jen del Muro's weekly Sketch For You To Try (posted each Saturday). The sentiment is computer generated and the little heart is a punch. Enabler Alert: I've been using my Stampin' Up! Basic Layers tool a lot lately. If you don't have one of these, you might want to consider adding it to your list. It makes it so easy to cut clean, uniform layers in 8 different widths. It takes a tiny bit of practice to get the hang of if you're not used to using a craft knife, but the crisp finish it provides is worth the relatively small investment. Supplies used -- Stamps: DoodleFactory Halloween by Sun Spirit Studios, available at www.starvingartistamps.com; Paper -- Basic Black, River Rock, Basic Gray, Whisper White, dp by Creative Memories; Ink: Palette Hybrid Noir; Accessories: Marvy Uchida Mega Scallop Circle Punch, EK circle cutter, Making Memories tag, ribbon, Copic Sketch Markers and Spica Glitter pens, 3-D Dots. My husband is a pretty good guy, but he can be a tiny bit… sanctimonious when it comes to issues of food and drink. (Sorry, honey, but you know it’s true. Love you!) For example, he thinks I’m being extremely high maintenance when I tell the folks at Subway that I want “easy lettuce, no tomato” on my sandwich. It’s Subway, for Pete’s sake! They make your sandwiches to order!!! And since the beginning of time, he’s tried to convince me that the world would be a more peaceful, happier place if I would just drink my coffee black. NEVER!! As I have told him for years, I like my coffee like I like my men: rich and sweet. 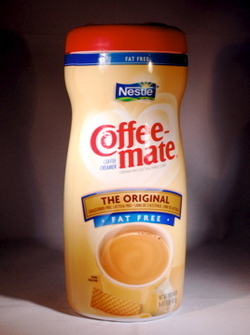 A perfect cup of coffee for me has two Splendas and enough fat-free Coffeemate to be the same shade as Creamy Caramel. Perhaps I have the sophisticated palate of a five year-old, but if I can’t drink my coffee just so, I’d rather not have it. I can see Sean and I having the same discussion about my coffee when we’re in our dotage. And you know what? That’s a little comforting, for some reason. Yesterday I ran out of Coffeemate. I was about to throw out the container, when I had a flash of brilliance – this would be a perfect project for this month’s Dirty Dozen “Lost & Found” challenge to recycle an item normally destined for the trash! I could make a cute container from which to pour my beloved Coffeemate, and simply refill it from here on out! I took a craft knife and carefully cut off the wrapper, hoping to use it as a pattern, but alas, that shrink-wrappy stuff can’t be duplicated through paper without a whole lot of wrinkling. Because of the curves of the canister, I thought the patchwork technique that I use to make my pumpkins might be a better way to go. A few pieces of dp inked with Staz-On, a little ModPodge, and my container just needed a wee bit of embellishing to finish. The star of my “Lighten Up” brand of creamer is none other than the DoodleFactory character, Zot. I wanted to make him look as pathetic as possible, in serious need of a caffeine fix, so I decided to make him flesh colored. After all, is there any situation in which you’d feel more vulnerable than being naked?? (If you can’t relate to that statement, you’re probably svelte and toned and I probably don’t want to be your friend. No offense.) The tag was made with shrinky-dink stuff. 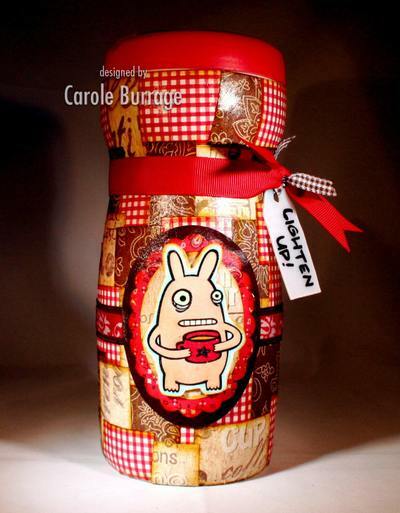 Supplies used: Stamps – Zot from DoodleFactory Creatures by Sun Spirit Studios, distributed by Starving Artistamps; Paper – Chocolate Chip, patterned paper by Flair and Creative Memories; Ink: Staz-On Saddle Brown, Brilliance Archival Graphite Black; Accessories: Coffeemate container, ModPodge, Copic Sketch markers, clear embossing powder, ribbon, shrink plastic, 3-D Dots, Creative Memories cutting system, Marvy Uchida Giga Scallop oval punch. I know this has been a long post already, but I do owe you faithful Freaky Friday Fans (both of you) a good and weird-but-true story. Since I’ve been speaking of coffee, I’d like to share with you the story of poor Stella Liebeck. Stella’s story was one of my favorites to tell my students in my previous life as a college professor. They were always amazed at how the truth of her plight was so much different than the pervasive myth surrounding her case. When I say “McDonald’s hot coffee case,” what do you think of? Frivolous lawsuits? Some dumb lady who got millions of dollars because she spilled hot – duh! – coffee while she was driving her car? Well, get a load of the real story. In 1992, Stella Liebeck was a 79 year old woman sitting in the passenger seat of her grandson’s car as he drove through a McDonald’s drive-thru in Albuquerque, NM. After receiving their order, the grandson pulled forward and then stopped his car momentarily so that Stella could add cream and sugar to her coffee. She put the Styrofoam cup between her legs and tried to pry off the plastic lid. When she did so, the entire contents of the cup spilled on to her lap. She was wearing sweat pants at the time which absorbed the coffee and held it next to her skin. She suffered full thickness burns (aka 3rd degree burns) over 6% of her body, including her inner thighs, perineum, buttocks and genital and groan area. She was hospitalized for 8 days, during which time she underwent skin grafting and debridement treatments. TO HER INNER THIGHS AND GENITAL AREAS!!! When she was released, she sought to have McDonald’s pay her medical bills which totaled $20,000. McDonald’s refused. During discovery, Stella’s attorneys were able to prove that there had been more than 700 claims by people burned by McDonald’s coffee during the previous decade. You see, coffee in your carafe at home is about 135-140 degrees. McDonald’s coffee was held at between 180-190 degrees. They did this because consultants advised this was temperature to maintain optimum taste. Unfortunately, as an expert in thermodynamics applied to human skin testified, liquids held at 180 degrees will cause full thickness burns to human skin in two to seven seconds. Other evidence showed that as the temperature of liquid decreases to 155 degrees, the burns relative to that temperature decrease exponentially. In other words, had Stella’s coffee been held at 155 degrees, she would have been able to avoid serious burns. When you get coffee in the drive-thru, where do you intend to drink it? I don’t know about you, but I plan to drink it in my car. Virtually all of the students I polled with that question over the years said the same thing. You know what McDonald’s argued? That their customers buy coffee on their way to work or home with the intention of consuming it once they arrived at their destination (despite their own research which showed otherwise). The jury awarded Stella $200,000 to compensate her for her injuries, and then reduced that to $160,000 because they also found her to be 20% at fault in the spill. The jury awarded her 2.7 in punitive damages as well (about two days of McDonald’s coffee sales). Eventually this amount was reduced by the judge to $480,000 (or treble damages – a statutory limit that punitive damages can only be three times the amount of compensatory damages; 3 x $160 K = $480,000), though he stated that he thought McDonald’s conduct was reckless, callous, and willful. But no one really knows how much Stella actually got, because the parties entered into a secret settlement (rather than duke it out for years in the appellate court system). After the verdict, the Albuquerque McDonald’s started holding it’s coffee at a temperature of 158 degrees. Okay, class dismissed. Enjoy you’re the rest of your Freaky Friday. 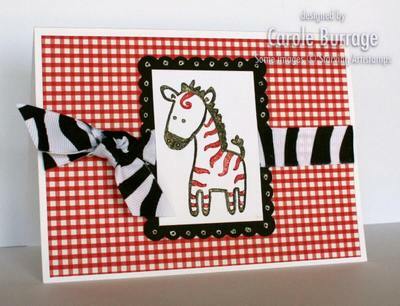 Remember a week or so ago when I posted my first card using Zeebo the Zebra? I said that if people where I lived found out, I'd be stamping Zeebo until my fingers were bloody stumps. Well, maybe I didn't say that exactly, but you get the gist. Anyway, add this to my list of prophesies come true (if you are keeping such a list, put it in a safe place. It may come in handy should I ever be considered for sainthood). After having been sited on my blog, I was commissioned to make three quilt plaques starring Zeebo for a class reunion this weekend. I think they turned out pretty cute, and the buyer was very happy. 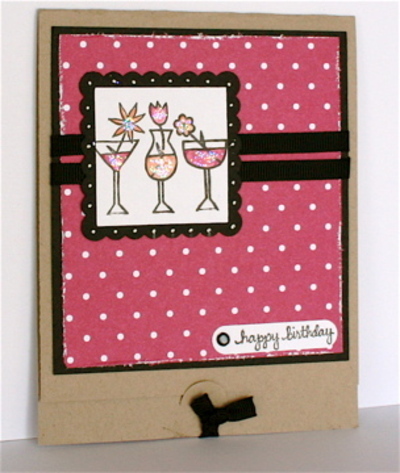 Zeebo was stamped on Shimmery White cardstock by using SU! Stampin' Write markers then huffing (as in breathing on the stamp to moisten the ink, not as in inhaling toxic chemicals for a cheap high). He was then covered in red and black Copic Spica glitter pens to make him extra sparkley. Now here's the part that I think is pretty clever and you might find useful yourself. I affixed a loop of ribbon on the back of the card through which a safety pin was then threaded. That way, if the quilts are hung, the plaque can be pinned to the quilt. And, if the person just wants to set it on a little stand, that's still fine, too. Perhaps someone else has done this before, but I haven't seen it. Handy!! Aren't you excited?! Freaky Friday is back, and this time, it's actually on Friday! So here's a freaky little card for your viewing pleasure. 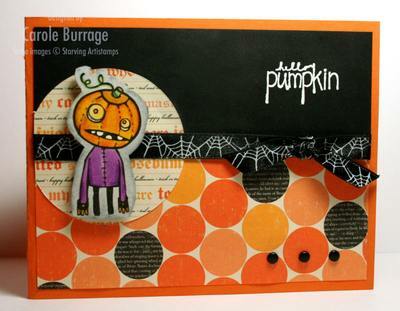 Yes, that's another Doodle Factory image from Starving Artistamps -- it's from their Halloween line. He's cute and creepy, don't you think? I made this for today's Limited Supply Challenge, which is to make a card using only 3 or 4 layers and simple embellishments. And let me tell you, this truly was a challenge. I didn't realize how many layers I tend to use until I have to count them. This card has four layers: a Pumpkin Pie base, the second layer made of Basic Black and the large Polka Dot, the circle behind the image, and the image layer. I actually had to do a lot of rearranging and changing from my initial plan as I went along, but I'm pleased with how this turned out. So you’ve seen the Pumpkinhead card. Do you remember Pumpkinhead, the movie? Well, it came out in 1989, so it’s a little bit dated. In case you didn’t see it, here’s the gist of it: some teenagers are camping (yeah, my mom always let me go camping with friends w/o supervision when I was in high school…) and they kill this boy in an accident then cover it up. The dead boy’s dad wants revenge and with the help of a local witch, they bring Pumpkinhead to life. Pumpkinhead starts killing the teens involved, but then Dad has second thoughts and eventually comes to the teens’ aid. But this is the wee bit spooky part. Pumpkinhead is apparently based on a poem by Ed Justin. Try as I might, I cannot find any information on said poet. Is Ed Justin real, or is he a hoax? If he isn’t real, then who wrote the Pumpkinhead poem? And what is the Pumpkinhead Poem? Well, I can at least answer that last question for you. Ooooh. Scary! And, of course, FREAKY!!! I finally had a chance to mount the Doodle Factory stamps I ordered from www.starvingartistamps.com, and I am loving them! They are way, way too much fun to play with. They've each got such personality, their own name, and they're utterly unique in the world of rubber stamping. Love, love, love 'em!! I made this little Lamb card for today's Ways To Use It Challenge, which was to use the new SU! neutral color, Basic Gray. Basic Gray is such a rich and elegant color; the paper equivalent of grey flannel. Basel (that's the lamb's name) was heat embossed with black embossing powder and his fleece was created with Liquid Applique. He was outlined with Copic Sketch markers. Anyway, I used the Big Celebrations set to make a card for today's Sketch Challenge. According to this image (which I colored with Copic Sketch markers and highlighted with Copic Spica glitter markers for a little sparkle), the females have a strict dress code that requires them to wear modest, full-skirted frocks. I faux stitched around the image panel, and the outer yellow panel was cut with scallop scissors. That yummy ribbon is also by SU! -- it's the new 5/8" grosgrain in Regal Rose. I love it so much that the answer to your unspoken question which I have telepathic received is YES, I would marry it but that's illegal seeing as I'm already married. 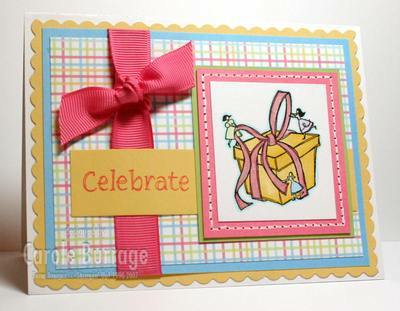 Supplies used: Stamps -- Big Celebrations by SU! ; paper (cardstock is all SU! unless otherwise mentioned) -- So Saffron, Regal Rose, Certainly Celery, PaperTrey White, patterned paper with light blue reverse-side by Treehouse Memories; Ink -- Brilliance Archival Graphite, Regal Rose; Accessories -- Copic Sketch and Spica markers, piercing tool, SU! mat pack, Signo white pen, ribbon, scallop scissors. (When you read that, did it sound in your head like Al Pacino in Scarface? If not, go back and read it again the right way.) Isn't this little zebra adorable?! I nearly kissed the computer screen when I first saw him at www.starvingartiststamps.com. You see, the Claremore (the town in Oklahoma where I live) school system's mascot is the Zebra (colors: red and black). Animal prints have been a big trend in decorating and clothing in recent years, but in Claremore, Zebra-ish items never go out of style. And quite frankly, most zebra stuff isn't all that cute. But -- Hallelujah! -- all that has changed now that I have found Zeebo (name of said Zebra, according to the manufacturer). I am going to use this stamp so much over the next decade or so, the rubber will be completely flattened by the time my youngest graduates. For example, this little card is the prototype for teachers' gifts for my oldest son to give this Christmas. I figure I'll make a set of six or so per teacher along with some sort of foodstuff. The design is somewhat simple to allow for mass duplicaton. Except for one detail: Zeebo is completely covered with Copica Spica glitter markers, so he's really sparkly in real life, which just adds to his sweetness. I love my new little Zebra friend! 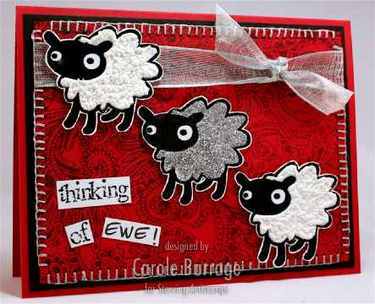 Supplies used: Stamps -- Zeebo from Doodle Factory Animals by Starving Artistamps; Paper -- prepackaged base card, PaperTrey White, Basic Black, red gingham by Creative Memories; Ink -- SU! Markers; Accessories -- Copic Spica glitter pens, Offray ribbon, paper piercing tool, Signo White pen, Marvy Uchida Giga Scallop Square punch. Lookie What I Got!! I love having friends who stamp and realize what a gift it is to send a handcrafted card! And that I have one who is also such a great friend, she's like a sister to me? Well, what more could I ask for?! 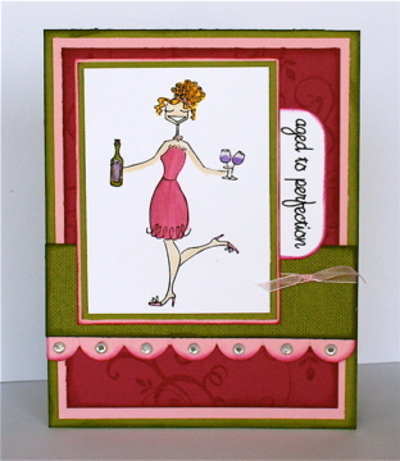 This GORGEOUS Bella card was made for me by Kristi (kmallett78) and is even more spectacular in person. Lots of bling, stickles, beautiful coloring, and the wine glass and bottle label even have Glossy Accents covering them to make them more realistic. Awesome, awesome, awesome. Know what's just as awesome? When someone you don't even know is sweet enough to send a beautiful handcrafted card, like this one I received from Jennie Moczan (mocjen). Jennie and I are both part of the A Muse Addicts group (I'll add a link to that group later in case someone reading this would like to join), and she thoughtfully sent me this lovely Bday RAK. Thanks, Jennie! You rock! !